I don't normally have a weakness for recipe books, but then these are no mere recipe books. (Well, at least two of them aren't - I'll hold off judgment on the new book from Mr Oliver for now. Looks good though). A colleague of mine brought The Silver Spoon into the office and I was sucked right in. D'you know what sold it to me in the end. The binding. This is a book designed to be used. Like a dictionary. Most impressive. As of Jamie, well I do have a soft spot for the much maligned fat-tongued one, regardless of the distaste of certain people (*coughTomcough*) and this book does look like it could be his How to Cook. I shall let you know how it turns out in due course. As any rate this may mean I actually cook for some of you (a dubious honour I have bestowed on few I have not lived with other than the vast cauldrons of spicy things purveyed housewarming parties over the years) so beware emails bearing invitations to consume experimental cooking. McGee is great. It's quite heavy going, but is great analysis. You might also like Herve This' "Molecular Gastronomy" which is a more lightweight read, although similarly engaging. I may have to have a borrow if you have a copy you can part with for a while? I have a copy of the Silver Spoon on order. I can't wait for it to show up! Hurrah! Here's to tasty Italian fabulousness!! My most-beloved cookbook (OK, so, it's four slim volumes, rather than the single-volume book) is /The Princesses' cookbook/, written by the headmistress of the Stockholm higher school of housemothership (call it "home economics" if you want). It contains a whole lot of things, including the essential fish tables (what fish are extra-good and extra-bad during what times of the year, at least along the swedish coast), at least two (I think three) recipes for puff pastry and, in general, alkl you could want out of a cookbook. It also has some assorted food storage theory and general food theory mixed in. Almost worth learning Swedish for. Mmm, meat. Perhaps one for the Xmas list. Agreed - The Silver Spoon is fanbloodytastic. 2 of those 3 books are ones I've been tempted by for ages... still tempted. 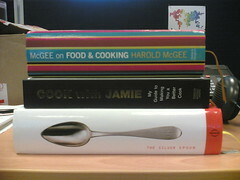 i love cookbooks!! I have this very colorful one on Indian cuisine but have not cooked a thing out of it. Which seems to be my pattern. Would have to start cooking at 15hr. to get on table 18hr. Maybe one day. Those books look very cool. you will have to cook for all of us in the states one night. i shall let you have my kitchen for the evening! I'll start wracking my brains now.